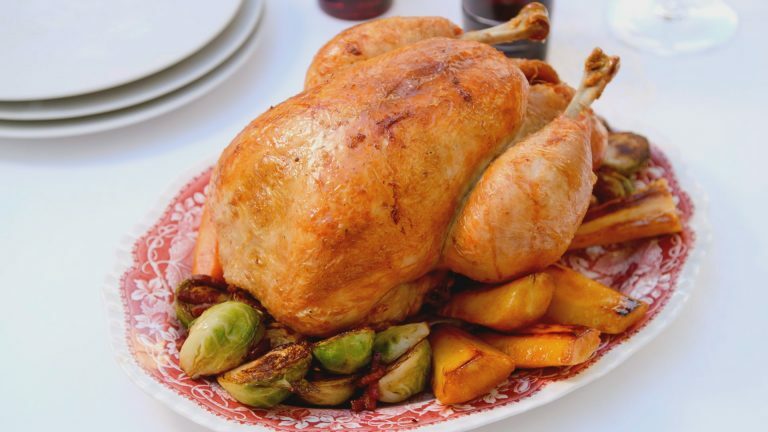 This grilled and roasted St Brides Chicken from Daniel Clifford is fragrant and moist with perfectly crispy skin. It's a great twist on a classic dish. Bring all the ingredients to the boil. Cool down and infuse for 24 hours. Pass through a sieve and store in the fridge. Remove the innards of the bird. Remove the neck and carefully take out the wish bone in one piece. Trim around both joints of the leg and pull, resulting in a clean socket bone. Repeat the process for the wing bone. Carefully place your hand under the breast skin to release it. Place the bird in the cold brine and place in the fridge for 12 hours. Remove the bird from the brine and remove all the Douglas Fir. Place bird on wire rack and allow to dry for a further 12 hours. Stuff the bird with hay and then pipe peanut oil under the skin. Tie the bird with string. Remove the bird from the fridge 30 minutes before cooking. Allow to come to room temperature. Pre heat the Big Green Egg barbecue to 170 degrees Celsius. Carefully place a rod through the neck of the bird and out the cavity. Place the bird breast side up on the rod. Cook for 20 minutes and then turn the bird over, so that the breasts are directed towards the heat. Remove from the barbecue and probe the bird at the thinnest part. If the bird hits 52 degrees Celsius then remove. Rest bird for 15 minutes. Place the bird in a pre-heated oven at 300 degrees Celsius for 3 minutes to even the colour. Once removed from the oven, remove the string and serve straight away.